Brassington, F. and Petitt, S. (2000) Principles of Marketing, 2nd edn. Financial Times/Prentice Hall, Harlow. See companion Prentice Hall web site (www.booksites.net/brassington2). Chapters 10 and 11 describe pricing issues in much more detail than that given in this chapter. Chapters 20, Strategic management, and 21, Marketing planning, management and control, describe the integration of marketing strategy with business strategy. Daniel, E., Wilson, H., McDonald, M. and Ward, J. (2001) Marketing Strategy in the Digital Age. Financial Times/Prentice Hall, Harlow. Clear guidelines on strategy development based on and including industry case studies. Deise, M., Nowikow, C., King, P. and Wright, A. (2000) Executive's Guide to E-Business. From Tactics to Strategy. Wiley, New York. An excellent practitioners' guide. Friedlein, A. (2002) Maintaining and Evolving Successful Commercial Web Sites. Morgan Kaufmann, San Francisco. An excellent book for professionals covering managing change, content, customer relationships and site measurement. Ghosh, S. (1998) Making business sense of the Internet, Harvard Business Review, March-April, 127-35. This paper gives many examples of how US companies have adapted to the Internet and asks key questions that should govern the strategy adopted. It is an excellent introduction to strategic approaches. Gulati, R. and Garino, J. (2000) Getting the right mix of bricks and clicks for your company, Harvard Business Review, May-June, 107-14. A different perspective on the six strategy decisions given in the strategic definition section with a roadmap through the decision process. Hackbarth, G. and Kettinger, W. (2000) Building an e-business strategy, Information Systems Management, Summer, 78-93. An information systems perspective to e-business strategy. Willcocks, L. and Sauer, C. (2000) Moving to e-business: an introduction. In L. Willcocks and C. Sauer (eds) Moving to E-Business, pp. 1-18. Random House, London. Combines traditional IS-strategy-based approaches with up-to-date case studies. • BRINT.com (www.brint.com). A Business Researcher's Interests. Extensive portal with articles on e-business, e-commerce and knowledge management. • CIO Magazine E-commerce resource centre (www.cio.com/forums/ec). One of the best online magazines from business technical perspective - see other research centres also, e.g. intranets, knowledge management. • DaveChaffey.com (www.davechaffey.com). Updates about all aspects of digital marketing including strategy. • E-commerce innovation centre (www.ecommerce.ac.uk) at Cardiff University. Interesting case studies for SMEs and basic explanations of concepts and terms. • E-commerce Times (www.ecommercetimes.com). An online newspaper specific to e-commerce developments. • E-consultancy.com (www.e-consultancy.com). A good compilation of reports and white papers many of which are strategy-related. • Financial Times Digital Business (http://news.ft.com/reports/digitalbusiness). Excellent monthly articles based on case studies. • Mohansawney.com (www.mohansawney.com). Case studies and white papers from one of the leading IS authorities on e-commerce. • US center for e-business (www.ebusiness.mit.edu). Useful collection of articles. 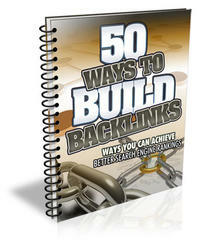 Report 50 Ways to Build Backlinks to Achieve Better Search Engine Rankings. This guide will help you Utilize These Awesome Methods to Achieve Better Search Engine Rankings.